The parish of Westfield lies in central Norfolk about 2 miles south of the market town of East Dereham. There is not much to Westfield merely a few properties around a crossroads of lanes along with scattered farms and cottages. 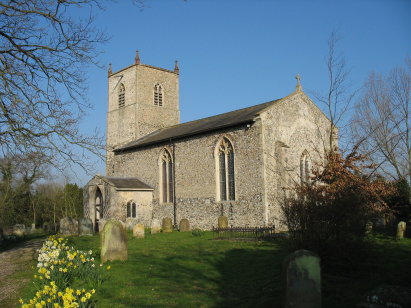 West field parish is one of Norfolk's smallest rural parishes covering just under 500 acres of mostly arable fields, although today East Dereham is spreading southwards and may one day engulf this tiny enclave. Westfield is located just a half mile to the east of the A1075 road which connects East Dereham, through Shipdham, to Watton & Thetford. The area is largely flat with almost endless skies and few contour lines in sight on the map for miles about the hamlet. St Andrew's church is located a couple of hundred yards to the east of the main crossroads of lanes, its tree-surrounded churchyard standing in marked contrast to the vast grain fields around it. The church appears curiously shortened which is due to the demolition of the chancel around 1700 so consists simply of the remaining nave and western tower. Pevsner grants the tower an early 14th century date and gives the southern porch a date of the 15th century but comments that the nave is "much restored" and does not date that piece. 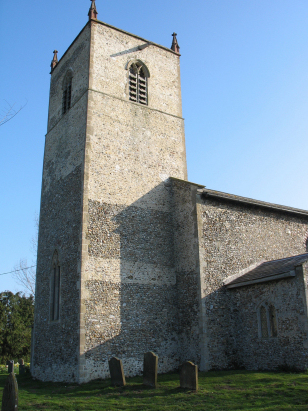 The church is, therefore, earlier than many of the surrounding Norfolk Perpendicular churches. The church sits on a slight bend in the lane and cannot be missed as the trees which surround its churchyard are the only feature for quite a distance. A metal gate grants access to what, thankfully, is a fairly open churchyard once inside. Sadly the register covering baptisms for the period of this transcript has yet to be deposited with Norfolk Record Office and this transcript has thus been prepared from the extant Bishop's Transcripts. Unfortunately these are incomplete as they run up to 1873 but the last 7 years are missing. The BTs are traditionally a difficult set to work with as preservation is not as good as whole registers but with the aid of the online images on the free web site Familysearch there were not too many issues with this set and hopefully few errors will have crept in.